We present a conformal metamaterial with simultaneous optical transparency and broadband millimeter-wave absorption for a curved surface. By tailoring the reflection response of meta-atoms at oblique angles, it is possible to achieve excellent absorption performance from 26.5 to 40.0 GHz within a wide angular range from 0° to 60° for transverse-electric and transverse-magnetic waves. In the meantime, by employing transparent substrates, including polyvinyl chloride and polyethylene terephthalate, good optical transmittance (80.1%) and flexibility are obtained simultaneously. The reflectivity of a curved metallic surface coated with the proposed curved metamaterial is simulated and measured experimentally. Both results demonstrate excellent absorption performance of the metamaterial, which is highly favored for practical applications. Y. Naito and K. Suetake, “Application of ferrite to electromagnetic wave absorber and its characteristics,” IEEE Trans. Microwave Theory Tech. 19, 65–72 (1971). S. Ohkoshi, S. Kuroki, S. Sakurai, K. Matsumoto, K. Sato, and S. Sasaki, “A millimeter-wave absorber based on gallium-substituted ε-iron oxide nanomagnets,” Angew. Chem. Int. Ed. 46, 8392–8395 (2007). A. Namai, S. Kurahashi, H. Hachiya, K. Tomita, S. Sakurai, K. Matsumoto, Y. Goto, and S. Ohkoshi, “High magnetic permeability of ε-GaxFe2-xO3 magnets in the millimeter wave region,” J. Appl. Phys. 107, 09A955 (2010). L. B. Kong, Z. W. Li, L. Liu, R. Huang, M. Abshinova, Z. H. Yang, C. B. Tang, P. K. Tan, C. R. Deng, and S. Matitsine, “Recent progress in some composite materials and structures for specific electromagnetic applications,” Int. Mater. Rev. 58, 203–259 (2013). H. L. Lv, Y. H. Guo, Z. H. Yang, Y. Cheng, L. Y. P. Wang, B. S. Zhang, Y. Zhao, Z. C. J. Xu, and G. B. Ji, “A brief introduction to the fabrication and synthesis of graphene based composites for the realization of electromagnetic absorbing materials,” J. Mater. Chem. C 5, 491–512 (2017). T. J. Cui, “Microwave metamaterials,” Nat. Sci. Rev. 5, 134–136 (2017). T. J. Cui, “Microwave metamaterials—from passive to digital and programmable controls of electromagnetic waves,” J. Opt. 19, 084004 (2017). D. R. Smith and J. B. Pendry, “Homogenization of metamaterials by field averaging,” J. Opt. Soc. Am. B 23, 391–403 (2006). N. I. Landy, S. Sajuyigbe, J. J. Mock, D. R. Smith, and W. J. Padilla, “Perfect metamaterial absorber,” Phys. Rev. Lett. 100, 207402 (2008). Q. Cheng, T. J. Cui, W. X. Jiang, and B. G. Cai, “An omnidirectional electromagnetic absorber made of metamaterials,” New J. Phys. 12, 063006 (2010). C. M. Watts, X. Liu, and W. J. Padilla, “Metamaterial electromagnetic wave absorbers,” Adv. Mater. 24, OP98–OP120 (2012). Z. H. Jiang, S. Yun, F. Toor, D. H. Werner, and T. S. Mayer, “Conformal dual-band near-perfectly absorbing mid-infrared metamaterial coating,” ACS Nano 5, 4641–4647 (2011). R. Yahiaoui, J. P. Guillet, F. de Miollis, and P. Mounaix, “Ultra-flexible multiband terahertz metamaterial absorber for conformal geometry applications,” Opt. Lett. 38, 4988–4990 (2013). H. Tao, C. M. Bingham, A. C. Strikwerda, D. Pilon, C. Shrekenhamer, N. I. Landy, K. Fan, X. Zhang, W. J. Padilla, and R. D. Averitt, “Highly flexible wide angle of incidence terahertz metamaterial absorber: design fabrication and characterization,” Phys. Rev. B 78, 241103 (2008). K. Iwaszczuk, A. C. Strikwerda, K. Fan, X. Zhang, R. D. Averitt, and P. U. Jepsen, “Flexible metamaterial absorbers for stealth applications at terahertz frequencies,” Opt. Express 20, 635–643 (2012). F. Zhang, S. Feng, K. Qiu, Z. Liu, Y. Fan, W. Zhang, Q. Zhao, and J. Zhou, “Mechanically stretchable and tunable metamaterial absorber,” Appl. Phys. Lett. 106, 091907 (2015). Y. C. Fan, F. L. Zhang, Q. Zhao, Z. Y. Wei, and H. Q. Li, “Tunable terahertz coherent perfect absorption in a monolayer graphene,” Opt. Lett. 39, 6269–6272 (2014). B. Wu, H. M. Tuncer, M. Naeem, B. Yang, M. T. Cole, W. I. Milne, and Y. Hao, “Experimental demonstration of a transparent graphene millimeter wave absorber with 28% fractional bandwidth at 140 GHz,” Sci. Rep. 4, 4130 (2014). Y. Okano, S. Ogino, and K. Ishikawa, “Development of optically transparent ultrathin microwave absorber for ultrahigh-frequency RF identification system,” IEEE Trans. Microw. Theory Tech. 60, 2456–2464 (2012). C. Zhang, Q. Cheng, J. Yang, J. Zhao, and T. J. Cui, “Broadband metamaterial for optical transparency and microwave absorption,” Appl. Phys. Lett. 110, 143511 (2017). J. Zhao, C. Zhang, Q. Cheng, J. Yang, and T. J. Cui, “An optically transparent metasurface for broadband microwave antireflection,” Appl. Phys. Lett. 112, 073504 (2018). D. W. Hu, J. Cao, W. Li, C. Zhang, T. L. Wu, Q. F. Li, Z. H. Chen, Y. L. Wang, and J. G. Guan, “Optically transparent broadband microwave absorption metamaterial by standing-up closed-ring resonators,” Adv. Opt. Mater. 5, 1700109 (2017). T. Jang, H. Youn, Y. J. Shin, and L. J. Guo, “Transparent and flexible polarization-independent microwave broadband absorber,” ACS Photon. 1, 279–284 (2014). Y. Shen, J. Q. Zhang, L. H. Shen, S. Sui, Y. Q. Pang, J. F. Wang, H. Ma, and S. B. Qu, “Transparent and broadband absorption-diffusion-integrated low-scattering metamaterial by standing-up lattice,” Opt. Express 26, 28363–28375 (2018). Y. Shen, J. Q. Zhang, L. H. Shen, S. Sui, Y. Q. Pang, J. F. Wang, H. Ma, and S. B. Qu, “Transparent absorption-diffusion-integrated water-based all-dielectric metasurface for broadband backward scattering reduction,” J. Phys. D 51, 485301 (2018). Y. Shen, J. Q. Zhang, Y. Q. Pang, J. F. Wang, H. Ma, and S. B. Qu, “Transparent broadband metamaterial absorber enhanced by water–substrate incorporation,” Opt. Express 26, 15665–15674 (2018). J. Sun, L. Liu, G. Dong, and J. Zhou, “An extremely broad band metamaterial absorber based on destructive interference,” Opt. Express 19, 21155–21162 (2011). Y. Shen, J. Q. Zhang, Y. Y. Meng, Z. L. Wang, Y. Q. Pang, J. F. Wang, H. Ma, and S. B. Qu, “Merging absorption bands of plasmonic structures via dispersion engineering,” Appl. Phys. Lett. 112, 254103 (2018). S. Liu, H. Chen, and T. J. Cui, “A broadband terahertz absorber using multi-layer stacked bars,” Appl. Phys. Lett. 106, 151601 (2015). B. Monacelli, J. B. Pryor, B. A. Munk, D. Kotter, and G. D. Boreman, “Infrared frequency selective surface based on circuit-analog square loop design,” IEEE Trans. Anntenas Propag. 53, 745–752 (2005). D. S. Dong, J. Yang, Q. Cheng, J. Zhao, L. H. Gao, S. J. Ma, S. Liu, H. B. Chen, Q. 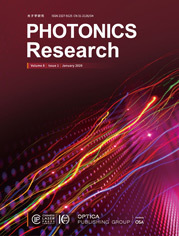 He, W. W. Liu, Z. Fang, L. Zhou, and T. J. Cui, “Terahertz broadband low-reflection metasurface by controlling phase distributions,” Adv. Opt. Mater. 3, 1405–1410 (2015). D. Y. Shchegolkov, A. K. Azad, J. F. O’Hara, and E. I. Simakov, “Perfect subwavelength fishnetlike metamaterial-based film terahertz absorbers,” Phys. Rev. B 82, 205117 (2010). P. K. Singh, K. A. Korolev, M. N. Afsar, and S. Sonkusale, “Single and dual band 77/95/110 GHz metamaterial absorbers on flexible polyimide substrate,” Appl. Phys. Lett. 99, 264101 (2011). X. P. Shen, Y. Yang, Y. Zang, J. Gu, J. Han, W. Zhang, and T. J. Cui, “Triple-band terahertz metamaterial absorber: design, experiment, and physical interpretation,” Appl. Phys. Lett. 101, 154102 (2012). H. Tao, N. I. Landy, C. M. Bingham, X. Zhang, R. D. Averitt, and W. J. Padilla, “A metamaterial absorber for the terahertz regime: design, fabrication and characterization,” Opt. Express 16, 7181–7188 (2008). F. Ding, Y. Cui, X. Ge, Y. Jin, and S. He, “Ultra-broadband microwave metamaterial absorber,” Appl. Phys. Lett. 100, 103506 (2012). J. Zhu, Z. Ma, W. Sun, F. Ding, Q. He, L. Zhou, and Y. Ma, “Ultra-broadband terahertz metamaterial absorber,” Appl. Phys. Lett. 105, 021102 (2014). X. Chen, B.-I. Wu, J. A. Kong, and T. M. Grzegorczyk, “Retrieval of the effective constitutive parameters of bianisotropic metamaterials,” Phys. Rev. E 71, 046610 (2005). X. Chen, T. M. Grzegorczyk, B. I. Wu, J. Pacheco, and J. A. Kong, “Robust method to retrieve the constitutive effective parameters of metamaterials,” Phys. Rev. E 70, 016608 (2004). D. M. Pozar, Microwave Engineering, 2nd ed. (Wiley, 1998). B. A. Munk, P. Munk, and J. Pryor, “On designing Jaumann and circuit analog absorbers (CA absorbers) for oblique angle of incidence,” IEEE Trans. Antennas Propag. 55, 186–193 (2007). S. Maci, M. Caiazzo, A. Cucini, and M. Casaletti, “A pole-zero matching method for EBG surfaces composed of a dipole FSS printed on a grounded dielectric slab,” IEEE Trans. Antennas Propag. 53, 70–81 (2005). Fig. 1. (a) Schematic of the flexible and transparent MMA at millimeter frequencies. (b) Geometry of a unit cell. Fig. 2. (a) Simulated absorptivity spectra of the proposed MMA under normal incidence. (b), (c) Simulated magnetic field distribution and surface current distribution of the meta-atom at 32.0 GHz under normal incidence. Fig. 3. (a) Schematic of the equivalent TL of the MMA. (b) TL model to retrieve the surface impedance of the ITO pattern. (c), (d) Calculated and simulated fr as well as absorptivity with change of incident angle. (e), (f) Dependence of the simulated absorptivity spectra on side length a and line width g. (g), (h) Simulated absorptivity spectra of the proposed MMA at incident angles from 0° to 70° for TE and TM waves. Fig. 4. (a), (b) Schematic of the conformal MMA backed by a conducting cylindrical surface under normal incidence of TE and TM waves. (c)–(h) Scattering patterns on the xoz plane at 32.0 GHz for TE and TM waves with r=75, 150, and 500 mm. (i), (j) Simulated RCS reduction of the MMA coating compared with the control conducting surface of the same size for TE and TM waves with r=75, 150, and 500 mm. Fig. 5. Simulated angular stability of the MMA coating compared with the control conducting surface of the same size for (a) TE and (b) TM waves with r=75 mm. Fig. 6. (a) Photograph of the fabricated sample, where the inset shows the measured light transmittance. (b) The whole experimental setup in a microwave chamber. (c), (d) Measured absorptivity spectra of the proposed MMA from 20.0 to 40.0 GHz at angles of 0°, 15°, 30°, and 45° for TE and TM waves. (e), (f) Measured RCS reduction of the MMA coating compared with the control conducting surface of the same size with r=75 mm under normal incidence of TE and TM waves. (6) RTM=ZS−Z0 cos θZS+Z0 cos θ.